Side One CLED Agar: Mackey and Sandy’s formulation this medium is popular for Urine Culture in the clinical laboratory. The lack of electrolytes inhibits the spreading of Proteus spp. and Bromothymol Blue indicator allows easy differentiation of Lactose and Non-Lactose fermenting organisms. Cystine is also present to benefit those organisms that have a particular Cystine requirement. Streptococcus pyogenes and many other fastidious organisms that do not require the presence of blood can grow on this medium. 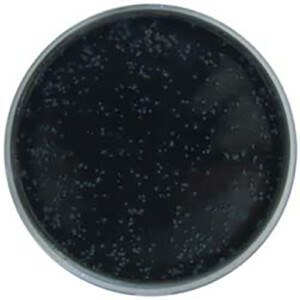 Side Two Primary UTI chromogenic agar – opaque: Recent developments in culture media have given rise to the use of chromogenic substrates as a means of differentiating bacteria particularly among the coliform group of organisms. This is one such medium and has been developed with the aim of simplifying the differentiation and presumptive identification of the main organisms usually found in Urinary Tract Infections. This is an opaque version of the Primary UTI Chromogenic Agar (PP3005). It is based on the traditional CLED Medium to prevent the swarming of Proteus spp. Two chromogens are present in the medium, one allows the detection of enterococci giving rise to blue colonies whilst the second results in purple colonies of E. coli. Phenylalanine and Tryptophan are also included as indicators of Tryptophan Deaminase activity producing brown colonies of Proteus spp.